Massive Wagons by Ami Barwell. Lancaster rock band Massive Wagons sold out their home town gig at the city’s library in just five days. They’re bringing a beefed up light and sound system to 300 lucky ticket holders, and a bar selling Motorhead Pale Ale and Cloven Hoof rum. The band, who are currently writing their fourth album, have been together for eight years, travelling the length and breadth of the country playing high energy rock and metal to an ever growing fan base. For three years they were playing around 100 shows a year. Frontman Barry Mills, originally from Millhead, said: “It’s our life really. “At the beginning, we were all single guys with no resposibilities. We’ve all still got full time jobs but we’ve had to be a little more exclusive for live shows. The band’s last two albums were released on the Ibiza based label Off Yer Rocka, so they got to play there as well. Their last album Back to the Stack went down well with fans and received a lot of radioairplay. Barry said: “There’s a lot of personal history in the band and that’s what keeps us together. We used to go out together watching local bands like Tin Pan Alley and The Bottlenecks, and we were always in The Pub watching bands from Manchester. Last year the band toured with Ginger Wildheart of The Wildhearts fame. “He’s become a friend of ours, and he’s done us no end of good. He’s always bigging us up!” Barry said. Massive Wagons are Barry, Adam and Alex Thistlethwaite, and Adam Bowskill. Carl Cochrane recently departed and the band will soon be looking for a fifth member but in the meantime it’s full steam ahead. “Lancaster is our home city, we used to roam the place,” Barry said. “We wanted to do a gig in Lancaster, as we haven’t played here for a long time. The show takes place on October 28, with support from Black Balled and Empyre. 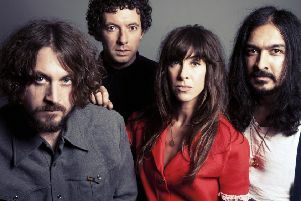 Barry, whose partner Terri manages their current record label, said the new album has become more “us” and had more of a Wagons style. “The songs have matured a lot,” he added. Massive Wagons recently did a photo shoot with photographer Ami Barwell, who has previously worked with Johnny Marr, Meatloaf and Lenny Kravitz.